Who doesn't know the Arco floor lamp with its marble base signed by Achille Castiglioni in 1962, or more recently, the spectacular Superarchimoon floor lamp by Philippe Starck? 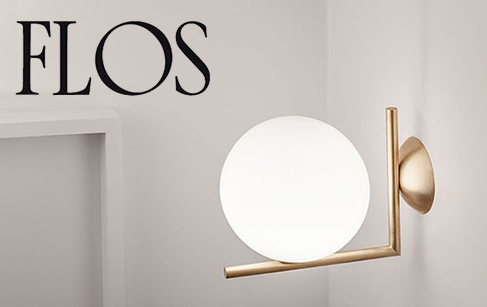 The famous Italian brand Flos' lighting collection brings together a multitude of icons of design history. Founded in 1962, Flos has, from the outset, worked with the most farsighted designers on the international scene: the Castiglioni brothers, Tobia Scarpa, and so on. In addition, Flos has a knack for discovering new talents. In 1988, the brand began working with a certain Philippe Starck... The Ara lamp was the result of this first collaboration, marking the beginning of a partnership which has spanned more than 20 years. In 1991, Starck designed Miss Sissi, a plastic bedside lamp which has become a cult item. The list of talented designers who have worked with Flos has grown significantly since then: Jasper Morrison, Konstantin Grcic, Antonio Citterio, Marcel Wanders, Piero Lissoni, Rodolfo Dordoni and Patricia Urquiola. Flos has always combined designers' creative genius with experimentation of materials and technologies. One of the first experiments was with the "cocoon" material, a plastic resin developed in the USA and used by Flos since the 1960s in its Gatto lamp. More recently, in 2007, Marcel Wanders designed the incredible Skygarden suspended lamp which combines an aluminium dome with plaster bas-reliefs! The Flos catalogue contains a vast array of different lamp styles, from the simplest to the most luxurious. These include the famous Toio lamp by the Castiglioni brothers which is shaped like a car headlightEach year, Flos creates ever more free and quirky items. They're always successful, and Flos has received many awards, including five Compasso d'Oro, one of the most prestigious design awards. In 2005, the architectural sector was given a big boost thanks to the creation of Flos Architectural Lighting, which offers a complete range of products to the professional market.